One year after the official visit of the Italian President Sergio Mattarella to Yaoundé, Paul Biya officially visits the Italian capital. They opened the meeting on 20 March at the Quirinale Palace in Rome. A face-to-face interview which provided an opportunity for both the leaders to discuss the issues at the heart of the priorities of each country. The counter-terrorism struggle for Cameroon, with reference to Boko Haram; The management of migratory flows through Italy, one of the main transit countries for migrants, particularly from Africa. These issues seem to be the cement of a strengthening of Italian-Cameroonian cooperation. «Our exchanges have revealed a broad convergence of views on the issues addressed,” as said President Paul Biya after the meeting at a press briefing given by the two heads of state. «Obviously, the fight against terrorism and Boko Haram were among the priorities since it remains a threat». «The fight against terrorism is one of the reasons that make our countries closer». 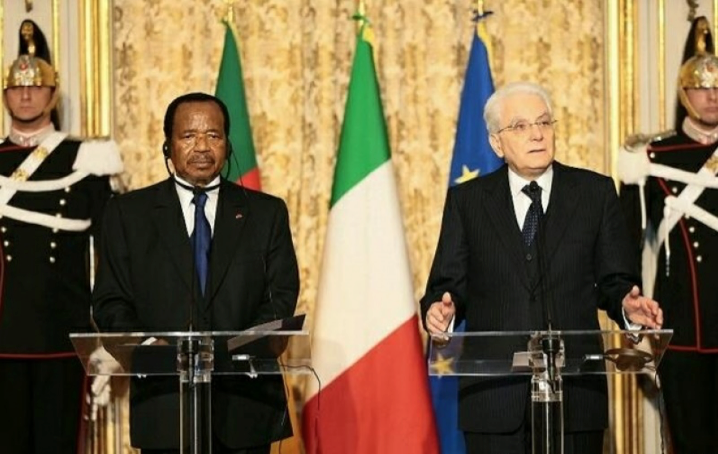 President Mattarella ensured the consolidation of this collaboration between Italy and Cameroon which has already «made significant progress” in one year. And the FIRST STATE VISIT of a Cameroonian President should only reinforce this partnership. «Cameroon is for Italy a priority partner”, as he said. The reasons which suggest that relations between Cameroon and Italy are excellent are an «intense economic collaboration, the appreciation of the Cameroonian Community in Italy and the important exchanges between the universities of Yaoundé and Rome». Furthermore, he confirms his support to the fight against terrorism that threatens Cameroon and all the European countries as well as the international community. «Today we are faced with major challenges: the fight against terrorism, the management of migratory phenomena. In Cameroon, a large number of refugees are welcomed with a real sense of responsibility. Challenges for collaboration between Cameroon and Italy as well as between Cameroon and the European Union. The fight against terrorism is one of the reasons that make our countries closer». The Italian President offered a gala dinner in honour of his Cameroonian counterpart and his wife on the evening of Monday. The two men took the opportunity to return to the main lines of cooperation between their two countries. For this official visit, President Paul Biya left Cameroon since Saturday 18 March 2017 with his wife and several other high personalities of the country.